Let’s know how you can enjoy this holiday destination which is so full of life throughout the year. With the help of our tips, your summer trip in Goa will become more fun-loving and enjoyable. By viewing the best attractions in Goa and by doing some fun-filled activities, it will become your memorable trip. Goa is always fun, no matter whether you are going there in winters or in summers. The beaches, Goan-cuisine, sunburn events, local beer, and wine, along with the fun activities, is what makes Goa a perfect destination for both summers and winters. However, when planning to go there in summers, there are few things which one should definitely take care of. Some of the places in Goa which you can visit during the summer season are the Dudhsagar Waterfall, Old Goa, Snow Park, different beaches of Goa, Caves, Wildlife Sanctuary & Bird Sanctuary, and local Goa Market. We suggested different beaches of Goa because, during summers, you will find a rush on the beaches. You will get to see a very calm environment all around. 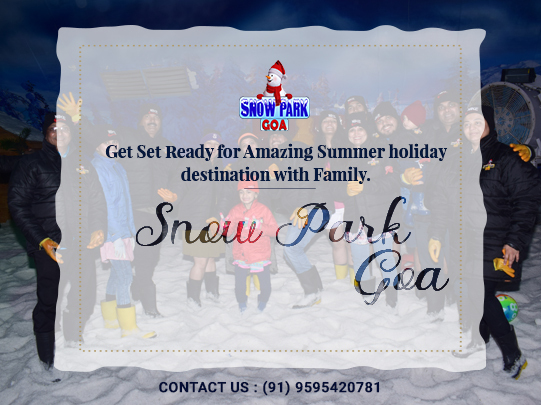 Snow Park is one such place where you will feel relaxed, as this place helps in getting relief from the scorching heat of Goa. This place is famous for different snow activities. You will get the feel of mountains and real snow in this snow theme park in Goa. –Goa offers many activities, but in summers, we suggest people stay away from the sun. And that is the reason, there are the limited number of activities which you can enjoy. But these activities are also real fun like you can do parasailing in Goa which is something adventurous. You can go on a Cruise to enjoy your evening, as it will be a breath-taking experience when you will sea water all around you. You can also look for the places to visit near Baga Beach which have casinos and clubs.As you can enjoy the view of Baga Beach, while playing your game or enjoying your drink.But the best activities which you can do during summers in Goa is in the Snow Park only. Be it the Ice Slide, or the DJ Party, or the different types of rides, people enjoy doing these activities, and that too in a chilling environment. There are many fun festivals also, that keep going in Goa during the summers. So, you can check the dates, when you are planning to come and check over the internet if there is any upcoming Goan Festival or not. This will help you come prepared for the festival also. Now, you know what all you can do in Goa, and which places you can explore in Goa. So, it is now your turn to know about some precautions which you can take in Goa during summers. Most importantly, do not forget to carry your sunscreen and that too with SPF 40. We suggest you wear cotton clothes only, as they are more comfortable. Do not forget to bring your scarfs and hats along. Keep yourself hydrated, especially during the day time. To add a soothing and different experience to your Goa trip, other than the beaches, do not forget to visit the Snow Park in Goa. This way you will have more fun by enjoying the beach view and participating in the fun activities in Snow Park.